The Virginia Judicial Inquiry and Review Commission (JIRC) has filed a complaint against two retired judges alleging that they violated the state’s judicial ethics code by campaigning against a referendum to relocate the Augusta County courts. Contrary to the JIRC’s position, judicial ethics advisory committees have concluded that matters of courthouse construction, renovation, and relocation concern the administration of justice and therefore constitute a proper subject of comment by judges. That is why the Washington State Ethics Advisory Committee informed judges that they could speak before Rotary Clubs and issue press releases in support of a bond campaign for a new juvenile court facility. The Arkansas Judicial Ethics Advisory Committee agreed that a judge may take a public position “in favor of, opposed to, or indifferent to” a proposed tax increase to fund a new courthouse and jail. Common sense dictates that judges possess relevant information concerning the need to revamp or abandon court facilities. Claims of unethical conduct have not been lodged against Chief Judge Thomas, Judge Bea, and Judge Kozinski for their testimony opposing the restructuring of the Ninth Circuit Court of Appeals before a subcommittee of the House Judiciary Committee. There seems to be little difference between federal judges trying to defeat a congressional proposal by presenting their arguments to Congress and C-SPAN, and state judges trying to defeat a referendum by presenting their arguments to the voters. In Houston this week? Join us for the Yale L. Rosenberg Annual Lecture - "What Does it Mean to Be the First? Lessons from Women Shortlisted for the U.S. Supreme Court"
Shortlisted for the U.S. Supreme Court"
An alumnus of Rice University, Yale L. Rosenberg graduated in 1964 from New York University Law School, where he was a Root-Tilden Scholar. Rosenberg joined the University of Houston Law Center in 1972 to pursue his true calling of teaching after a distinguished career in government. His inspired instruction in Civil Procedure, Federal Jurisdiction, Professional Responsibility, and Jewish Law at the UH Law Center earned him the UH Teaching Excellence Award in 2000. 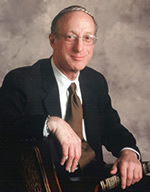 An award-winning scholar, Rosenberg has been called “America’s prophet” for his analysis of the decline of federal habeas corpus. Rosenberg’s successful academic career was matched only by his marriage to Irene Merker Rosenberg. Those who knew Yale and Irene marveled at the great love between them for more than 30 years, as marriage partners, collaborators, and colleagues. 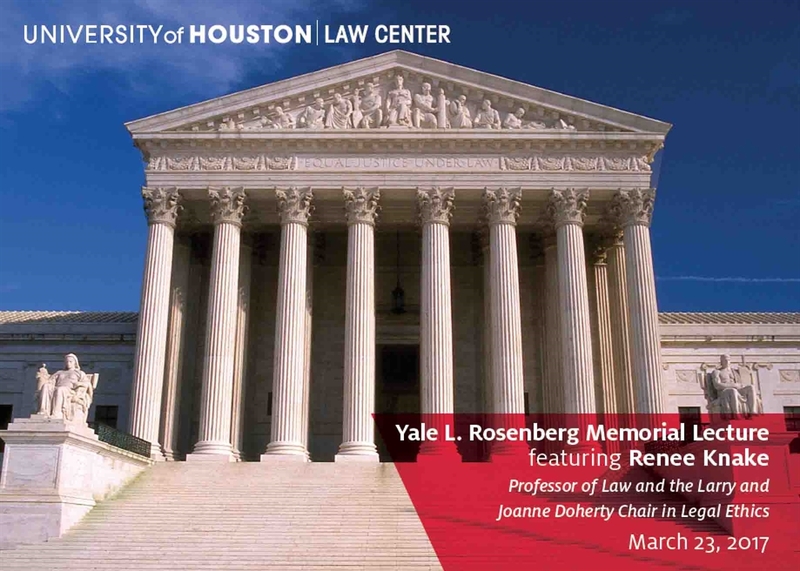 The Yale L. Rosenberg Memorial Fund was established to recognize and foster excellence at the UH Law Center. The endowment is used to fund a student writing prize and to bring distinguished speakers to the UH Law Center. Professor Renee Knake joined the Law Center faculty in 2016 after serving as the Foster Swift Professor of Legal Ethics and co-director of the Kelley Institute of Ethics and the Legal Profession at Michigan State University College of Law. In 2015, she served as scholar-in-residence at Stanford Law School’s Center on the Legal Profession and as a visiting scholar at the American Bar Foundation. Her expertise and research interests include the First Amendment and the regulation of attorney speech; legal ethics, especially conflicts of interest; access to justice; innovation in the delivery of legal services; and gender and the legal profession. Knake is an author of the casebook “Professional Responsibility: A Contemporary Approach,” and numerous scholarly articles. Her work has been cited in briefs before the U.S. Supreme Court as well as a range of media including the Wall Street Journal, National Public Radio, Bloomberg Law, and the ABA Journal. From 2014-2016, she served as the Reporter for the American Bar Association Presidential Commission on the Future of Legal Services. Her work on entrepreneurship and innovation in legal services has been recognized by numerous national awards and private grant funding. 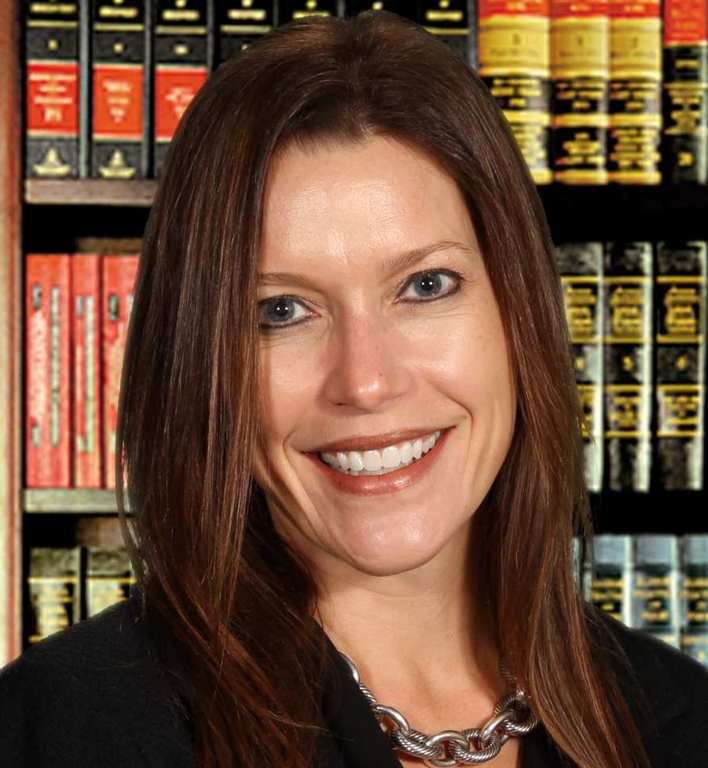 Before her academic career, Knake practiced law at Mayer, Brown in Chicago and Hunton & Williams in Richmond, Va., where she specialized in commercial litigation, telecommunications, and labor/employment law. She earned her J.D. from the University of Chicago Law School in 1999. 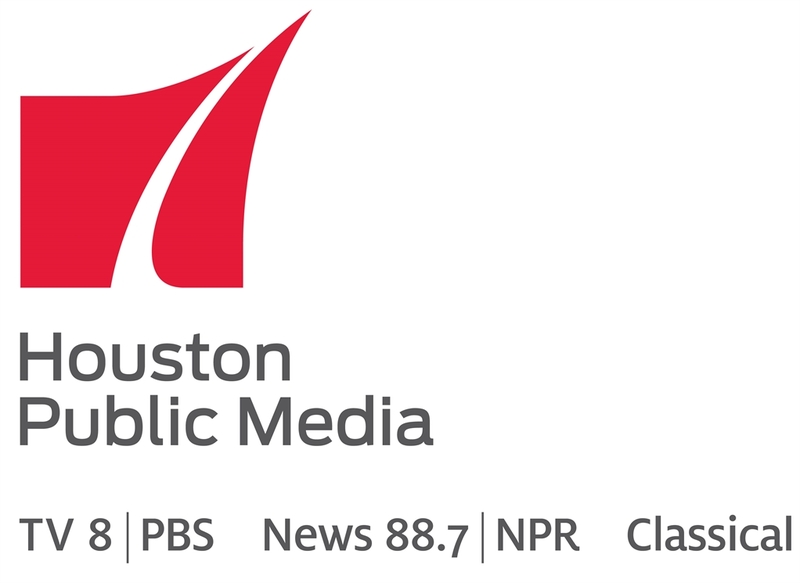 The University of Houston is a Tier One research institution and an EEO/AA institution. Did Giuliani Improperly Disclose Trump's Confidential Information? In the various challenges to Trump's two travel bans, the challengers cited and the courts referenced Giuliani's TV interview in which he disclosed that Trump had asked him to fashion a travel ban that would achieve Trump's goals legally. Specifically, the Washington Post reported Giuliani's comments on Fox quoted below. Did Giuliani disclose confidential information? Maybe he had express or implied permission if so. It might have seemed that the disclosure would help Trump, though it has made the bans appear to be a subterfuge. “I'll tell you the whole history of it,” Giuliani responded eagerly [to a question in a Fox interview]. “So when [Trump] first announced it, he said, 'Muslim ban.' He called me up. He said, 'Put a commission together. Show me the right way to do it legally.' "
Note: This post has been edited by adding the second paragraph of the Slate article, which I had inadvertently omitted. Was Sally Yates relying on Ronald Dworkin? If so, is that a problem? Whether the order is lawful will be determined by the courts. What interests me, as a scholar of legal ethics and jurisprudence, is whether Yates got it right when she said the responsibility of a lawyer for the government is to seek justice and stand for what is right, and that the position of the Department of Justice should be informed by the lawyer’s best view of the law. Yates’s claim that legal advisor should be informed by the best view of the law sounds very much like the position of Ronald Dworkin, who argued that a judge should determine the legal rights and duties of the litigants by constructing the best possible interpretation of the principles of justice, fairness, and procedural due process, considered from the standpoint of the community’s political morality. The interpretation must fit with past legal decisions, but the judge’s aim is also to show the community’s legal practices in their best moral light. I do not know whether Yates was thinking about Dworkin when she wrote her letter, but I wish to use this essay to seek to persuade legal advisors – whether to the government or a private client – that their role is not to construct an interpretation of the law that represents the best constructive interpretation of political morality. Wendel's scholarship is always worth reading, and this essay is no exception. In previous work, I've pushed back a bit on his recurrent thesis that a lawyer's duty of loyalty to the client is vindicated through the lawyer's duty of loyalty to the law, period. My core concern with Wendel's approach is that our focus on the client as a citizen may obscure a view of the client as a person, though the dynamics are a little different in the context of a government lawyer, and I share his misgivings about Yates' explanation. If you're interested, you can read a fuller explanation of my reservations with Wendel's approach here.